As you have made the decision to visit it just shows that you have a passion, like ourselves for the Historic range of RAF Bombers (Vickers Valiant, Handley Page Victor & Avro Vulcan) that were initially designed to carry the UK's Nuclear deterrent and were at the leading edge of British aircraft design. Whether you enjoy the history of the Cold War, the story of the daring 'Black Buck' raids during the Falklands Conflict or have been awe struck by the majestic return to flight of Avro Vulcan B.Mk2 XH558 we are sure that you will enjoy this site and once seen, we know that you will return. Museums actively preserving V-Force & Cold War era airframes plus Cockpit/Nose sections etc.. See Links section! Hand painted images on canvas bags, unique and individual, ideal as a gift or to spoil yourself. Created by Stuart Fowle, who also has a passion for aviation along with his talent for painting and drawing. "We are forever indebted to Stuart who helped us bring to life our #twitterVforce crest - from what was essentially a pipe dream. Please take a moment to have a look at his work and hey, why not commission him to create a special, one of a kind, little piece of V Force History for yourself"
What is the purpose of #twitterVforce? As the title suggests, it all began on Twitter and it is related to the Cold War era V-Force Nuclear carrying Royal Air Force bombers. 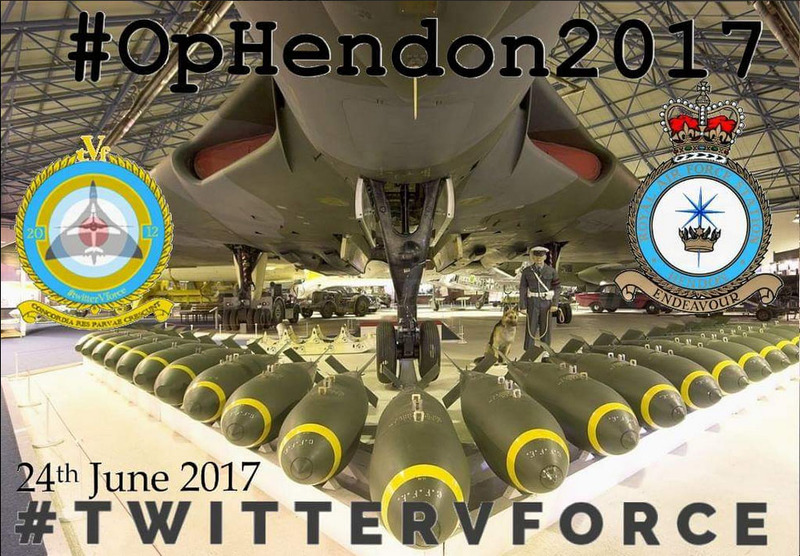 The purpose of #twitterVforce Hashtag is to help to promote & raise awareness of the V-Force preservation projects, such as the Avro Vulcan & Handley Page Victor preservation. When you tweet Vulcan, Victor, Valiant content on Twitter, don't forget to include a #twitterVforce hashtag! This ensures maximum exposure & retweets etc. which in turn helps to 'spread the word'!